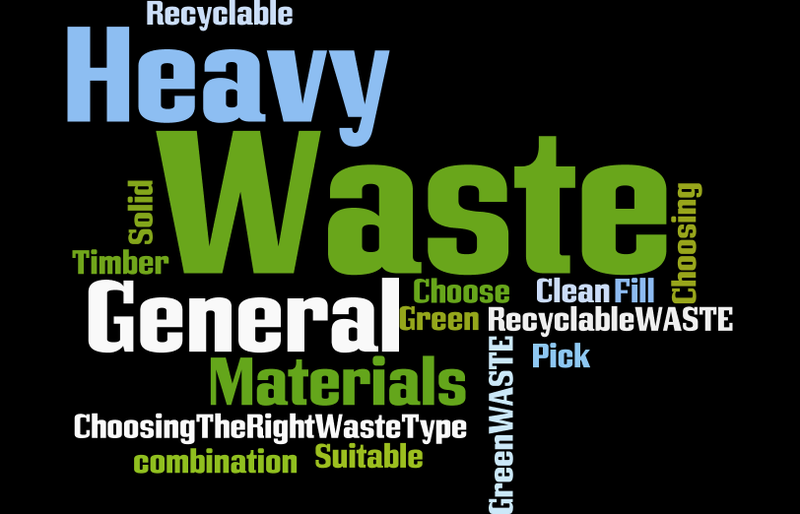 Choosing the Right Waste Type ? Why do we ask what waste types you have? The reason we ask what waste types you have is firstly to match the size bin that best suits your needs and secondly to ensure that once a bin, is filled, we can lift it back onto a truck and safely transport the bin. Once this consideration has been made we then look at the various waste types, bin size and what opportunities there are to dispose of certain waste types to determine a price for this service. Sometimes this may result in being able to offer a discount on some waste types. In addition to this, the environment is important to us, so our company objective is to achieve a reduction of waste that ends up in a landfill by implementing a recycling, resource reduction and recovery program. Our focus is on the redirection of waste away from landfill to alternative uses. Since there are so many ways to reduce, reuse and recycle waste, only a small amount of waste needs to end up as landfill, and waste disposal should be the last option. We achieve this by managing the types of waste handled in our bins. We have put together the information below to help you to choose the right bin for your rubbish removal needs however if you still need more information feel free to ring us for free friendly advice on 3821 6400 or contact us by email. Often speaking to us will provide a different price than we can offer on the website if you have recyclable materials/products. You can obtain a price/quote for each waste & bin combination on the ‘Online Booking Form‘. If you’re happy with the quote, then click ‘Proceed with Booking’ to complete the booking process. We also offer flexible pricing depending on your location; the size skips you require, the type of waste and the weight of the items you need to dispose of so call us for a price tailored to your requirements on (07) 3821 3200. Large quantities of Styrofoam such as Coldroom Paneling, Insulated Roofing etc. Whilst we may not generally transport some waste types we may still be able to provide a solution or advice. Suitable for most general household, business & commercial, institutional, industrial, landscaping, construction, and demolition waste. You can include green waste and small amounts of heavier items. Heavy waste types i.e. concrete, bricks, pavers, soil, clay, rocks, stones, tiles etc. Strictly suitable for timber or garden waste i.e. trees, branches, leaves, grass clippings, wood, wood chips, and bark & other organic recyclable garden material. Please contact our office for information on root balls and large tree trucks or bulk loads of timber. Suitable for a mixture of General Waste, Green Waste, Timber and Heavy Materials such as concrete, bricks, pavers, soil, clay, rocks, stones, tiles etc. For this waste type, bin weight limits are calculated in the pricing of bins. For loads that exceed the allowance, an additional disposal fee will be charged. This amount per tonne will vary depending on the nearest disposal option. These loads consist of 100% sorted and separated recyclable products such as concrete, bricks, soil, steel and other separated recyclable waste streams. STRICTLY: 100% Clean and separated materials suitable for recycling without sorting. 15m³, 20m³, 25m³, 30m³ for other recyclable waste streams/products by arrangement. Skip Bins Brisbane Group t/a Handybin & Big Bins ‘do not transport regulated wastes‘ i.e. asbestos, tyres, wet paints and liquids (includes drums containing liquids) etc. Some waste types are restricted or semi-regulated in relation to how they are to be handled or disposed of i.e. carpet and old lino which may contain chemical dyes and/or asbestos. Other types such as asbestos sheeting such as super six roof sheeting and old cement sheeting containing asbestos. These are a ‘regulated waste’ and must be handled and disposed of in a specified manner and at an approved disposal facility. If you need to dispose of Asbestos type waste and you need more information you can visit the Queensland Government, Workplace Health & Safety site for more information. Phone our office if you are unsure or need any advice in relation to these types of waste. If we are unable to help you we will refer you to your local council or the EPA who may be able to provide you with more information. You can read more information on Regulated Waste. Movement Controls apply to restricted items soil (includes fill, clay, overburden, scrapings, topsoil, decomposed granite (deco), potting media and any other material from the ground), mulch, manure, bark, hay, pot plants, potting media, turf, sleepers/logs, gravels, poultry litter. For more information read FAQ 12 or visit the Queensland Department of Agriculture and Fisheries website. Copyright © 2019 Skip Bins Brisbane. All rights reserved.